Happy July, from all of your friends at Hutcheson Horticultural! With the start of a new month, we like to give you great tips for all of your horticultural needs, and this month is no different! 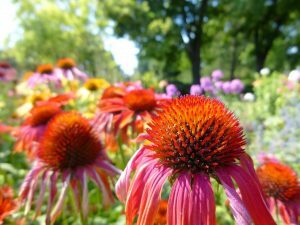 We have just a few tips for July that will keep your garden and landscape looking beautiful all throughout these hot summer months. Tip 1: Mow, trim, and edge lawn areas: It is vital to maintain your lawn, even throughout the summer. Tip 2: Prune shrubs, as needed: For the same reason it is important to mow, trim, and edge your lawn, shrub maintenance is important for the overall look of your yard. Tip 3: Inspect trees, shrubs, and turf for insects and disease: This is very important, especially at a time of year when insects are most active, because early detection is the key to saving your plants. Be diligent, and keep a watchful eye for anything that seems “off.” If you are unsure, give us a call. Tip 4: Continue flower maintenance, which includes dead heading, fertilization, and weeding: Your warm weather flowers should be loving the heat, but it is important to check on them often to keep them looking their best! Tip 5: Apply post-emergent to control weeds as necessary: Often, stubborn weeds that were not eliminated in the winter or spring will attempt to take over your garden or lawn. Applying post-emergent will help to control these stubborn nuisances. Tip 6: Check and adjust your irrigation system: Ensure your irrigation system is working properly and optimally by checking often. Tip 7: Hydroseed lovegrass and warm season grasses: This will ensure a lush, beautiful lawn for the next year! We hope everyone has a fantastic July! Remember, if you require any of our services, to contact us!